I am a Mosaic Newbie. 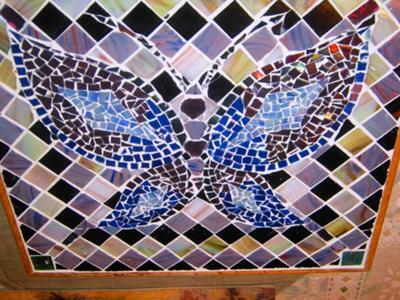 I have done two other mosaics, but this was the first one I designed myself. I made this for my Mom because she loves butterflies.... and I love her. My husband was a big help with 1) dealing with flying pieces of glass, 2) encouraging me when my perfectionism started to break my focus, and 3) with building the frame so we could make it a trivet for Moms table!